In 1614, a mysterious document entitled the Fama Fraternitatis appeared in the German town of Kassel, and ignited a firestorm of interest all over Europe. This document described a fantastic tale of a secret brotherhood of adepts who called themselves Rosicrucians and their enigmatic founder, Christian Rosencreutz, or C.R.C. The Fama announced the existence of a secret Fraternity of the Rose Cross, and described the life and teachings of Christian Rosencreutz. It went on to describe the vault in which C.R.C. and much of the Rosicrucian’s secret knowledge were buried. The document finally invites all like-minded individuals to contact the Brotherhood and share in its alchemical wisdom and spiritual wealth. Publication of the Fama caused a commotion. Traditionalists condemned the shadowy Rosicrucian brotherhood. Skeptics doubted its existence. Hermeticists embraced it. And several people tried to find and join the enigmatic fraternity. Printing presses all over Europe were kept busy publishing books and other documents on the subject. Within a couple of years two other Rosicrucian manifestos appeared: The Confessio and the Chemical Wedding of Christian Rosencreutz. The Confessio offered a few more details concerning the membership of the Rosicrucian Fraternity, while the Chemical Wedding was an alchemical fable filled with symbolism and allegory. Some of the theories concerning the origin and motives behind the publication of the Rosicrucian Manifestos are worth mentioning. In her book on The Rosicrucian Enlightenment, Frances Yates describes how the Manifestos may have been part of a planned propaganda campaign to promote a Lutheran-Hermetic movement to support the reign of Frederick the 5th, King of Bohemia in opposition to the Catholic House of Habsburg. The manifestos were probably written by a group of college students, who attended the University of Tubingen and were members of a circle of Christian Hermeticists. Among them were Tobias Hess, a student of Paracelsus, and Johann Valentin Andreae, who became a Lutheran minister and later admitted to writing the Chemical Wedding as a joke. Whatever the origins of Manifesto might have been—whether spiritual, political, or even mythological—their influence on the Western Esoteric Tradition was certainly no joke. As a whole the three Rosicrucian Manifestos described the beginning of a new spiritual age—an age structured around Lutheran idealism, social reform, alchemical teachings, astrological symbolism, Hermetic magic, and Christian mysticism. What does this mysterious description refer to? What is this strange hidden room that seems to lie at the heart of the Rosicrucian tradition? What is the knowledge it contains? And are hints of this knowledge given elsewhere in the Rosicrucian teachings? And where is the tomb of Christian Rosencreutz to be found? In this brief lecture I hope to provide a few answers to these questions and further food for thought. The Fama tells us that when the Rosicrucian Brotherhood rediscovered the tomb of their founder, their appeared to their sight a vault of seven sides. In the center was a circular altar engraved with figures and words, which was set over the sarcophagus of Christian Rosencreutz wherein the uncorrupted body lay. Triangles were inscribed within the ceiling and the floor. The room was illuminated by a “second sun” while the floor contained the names of the “inferior Governors” or infernal spirits. Each of the seven walls of CRC’s tomb was divided into ten squares which in turn were inscribed with several figures and sentences. Each wall also had a door for a chest which contained “diverse things” including books, parchments, looking glasses, bells, burning lamps, songs, and the Minutum Mundum or “small Universe.” In other words, what the vault contained was the whole of the Rosicrucian secrets and mysteries. But why were all these “diverse things” described as a summary of the “Universal Unity”? The Rosicrucian texts often describe the idea of the “Universal Unity.” “Omnia ab Uno,” (All from One) is one of the sayings of the Rosicrucians. It expresses the idea that God is One—an undividable Whole—and that everything in the cosmos has evolved from this One Eternal Source. The various activities of Life, which we see in the universe around us, are simply the various forms of the manifestations of God. This Creative Power of God, or the substance of Light and Life, is sometimes called the Logos, the Word, or Christ. Here we see an 18th- century alchemical engraving showing the “Compass of the Wise” as well as the seven-pillared House of Wisdom, complete with the seven planets, the four elements, and various Masonic and alchemical symbols. As the Universal Unity manifested itself into the cosmos, it assumed various forms, qualities, and functions. Therefore it appears to the outside observer as a multiple variety of unrelated objects, forms, energies, or substances. It often appears as a series of dualities. And yet to Rosicrucians, alchemists, and mystics, all these forms and powers are essentially One Unified Whole. The various astrological and qabalistic words and images used by alchemists and Rosicrucians—as well as the angels, archangels, elements, planets, zodiacal signs, and spirits cited by magicians— are not meant to describe powers and qualities that are fundamentally different from each other. Alchemists often used the image of the mountain for the completion of the Great Work. 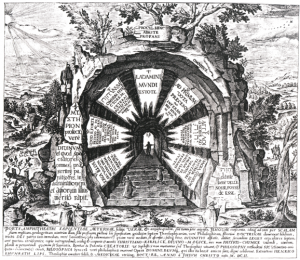 In this 17th century engraving we see the Mystic Mountain of Initiation. Here we see a blindfolded alchemist groping his way to find the path up the Mountain. He is blindfolded because the wisdom he is looking for, lies within. There are seven steps which lead up the mountain. On them are written the names of seven alchemical processes which correspond to the seven planets, symbolized by the seven deities standing on the mountain. Just as in the tomb of CRC, the planetary number, seven, has a special importance. 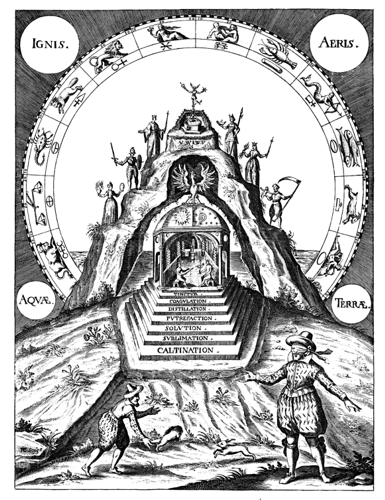 The mountain itself is circled by the wheel of the Zodiacal Signs, and symbols of substances which are used in alchemy. As stated earlier, these various images, ideas, figures and substances are not meant to describe powers and materials that are fundamentally different from each other. They are simply different aspects of the One Universal Principle. They are the Universal Unity in all of its manifestations. At the center of the mountain is a chamber or room—the temple of the Sun and the Moon whose union results in the creation of the Philosopher’s Stone, which is a symbol for true spiritual attainment. Could this be an early representation of the “diverse things” and ideas contained in the Tomb of CRC? Here we see an illustration of what appears to be the mouth of a cave, with trees growing above it, leading underground to the Qabalistic source of Light and “the eternal center of Life.” It shows the lovers of Divine wisdom rising seven steps up the mystic ladder. The gate contains 7 pieces of advice on dealing with the celestial powers. Yeheshuah is the divine name of Jesus associated with the Christian Qabalah—it is the divine name of the God of the Old Testament, YHVH, with the Hebrew letter Shin, signifying spirit, and transforming the Tetragrammaton or “four-lettered name” of God, into the Pentagramaton, or “five-lettered name” of the Redeemer. In the Golden Dawn system I.A.O. is a reference to the cycle of life, death, and resurrection from death. The Fama describes the Rosicrucian Vault as the Tomb of Christian Rosencreutz. On one level, the story of the life of CRC is symbolic of the life of Christ. But unlike Christ, CRC is not resurrected, although his body is perfectly preserved. His tomb is a tomb of Death. And yet the opening of CRC’s tomb announces the rebirth of the mysterious Rosicrucian Brotherhood as portrayed in the Fama. Therefore the Vault is a symbol of death and spiritual resurrection. The science of alchemy has long been thought of as the domain of the Rosicrucians. To readers of the Fama, CRC’s uncorrupted body hinted at alchemical secrets that the mysterious Rosicrucians may have been used to preserve his remains. Whether this was meant to tease the imagination of readers is unclear. What is clear is that the idea of death and resurrection is inherent to the practice and the literature of alchemy. Alchemy is an ancient science that is concerned with purification and transformation. Spiritual, alchemy is concerned with the transformation of the human soul from a state of baseness to one of spiritual enlightenment. In spiritual terms, Alchemy is symbolic of a conversion from the heavy, leaden, earth-bound consciousness to the refined gold of the divinely-inspired being. The alchemical process is said to take place in three primary stages: separation, purification and cohobation (or recombination). This is an internal process in which the various parts of the base material being transformed are analyzed and separated. This is often referred to in alchemical literature as a form of death or dismemberment and it is often symbolized in alchemy by images of a black crow, or a dragon. In alchemy the separated portions are then cleansed or purified. Finally, they are recombined into a new, more purified whole that is greater than the sum of its parts. This part of the alchemical process is often symbolized by the concept of rebirth or resurrection from death. 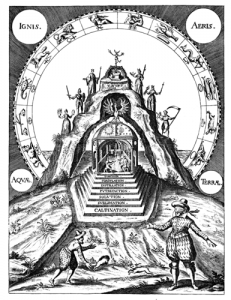 The Vault of the Fama is symbolically an Athanor or alchemical oven wherein the first matter—in this case, the body of CRC and the secrets that were buried with him—are transformed into the resurrected Rosicrucian Brotherhood whose purpose is to raise the spiritual consciousness of humanity. On one level this can be seen as the Fraternity’s Greatest Work of alchemy, to obtain the Philosopher’s Stone (which is a metaphor for spiritual attainment) with which the “General Transformation of the Whole World” may be accomplished. Osiris was the Egyptian god of the dead and the god of resurrection. Legend has it that Osiris was killed by the evil god Set who entombed the body in a chest and cast it into a river. The chest containing the body was eventually discovered by the goddess Isis, but Set found it and disremembered the body into fourteen pieces which he scattered. Isis patiently searched for the remnants and found them. She re-assembled the body, except for the phallus. Aided by the gods Thoth, Anubis, and Horus, Isis was able to restore the dead Osiris back to life. Here we see a 17th century alchemical engraving of Isis collecting the scattering pieces of the corpse. In the foreground Osiris, also known as the King, is emerging whole (or fixed) from a coffin. Death, dismemberment, and resurrection are re-occurring themes in alchemical and Rosicrucian texts. As a whole, the story of Christian Rosencreutz is symbolic to the story of Jesus Christ. So it is no surprise that the magicians of the Golden Dawn saw a common theme of death and resurrection connecting the figures of Osiris and Christ. In the Adeptus Minor ceremony of the Golden Dawn, the sarcophagus of Christian Rosencreutz from the Fama, and the coffin of Osiris from Egyptian legend, and the tomb of Jesus Christ from the New Testament, all became identified with the Pastos of CRC, from which the Chief Adept of the ritual symbolically rises from the dead, infused with new spiritual life. In the story of the resurrection of Osiris, the Goddess Isis plays an important role. In this respect, the tomb of CRC, a tomb of Death, was also a womb of rebirth into a newer more exalted life. In the Golden Dawn’s Vault of the Adepti, this was symbolized by the door of the Vault being located on the Wall assigned to the planet Venus. Only through the door of Venus was entry into and out of the tomb possible. Here the vault or sepulcher is also a symbol of the wedding chamber, and CRC, like Christ, is the bridegroom. The idea here is that of spiritual marriage, wherein two become One. Of all the planets, the symbol of the planet Venus is the only one said to embrace all Ten Sephiroth on the Qabalistic Tree of Life. In the Golden Dawn system Venus is attributed to the Hebrew letter Daleth, which means “Door” indicating that Venus or the Power of Love is the door of initiation into the Higher Mysteries. In the Second Order of the Golden Dawn this is also symbolized by an implement carried by the three main Officers—the Crux Ansata or Ankh, the Egyptian symbol of Life—said to be “a form of the Rose and the Cross” which is the Key that opens the Tomb. It is also the planetary symbol of Venus. It is likely that some of the Vaults from the early days of the Golden Dawn were painted on large sheets of canvas, intended to be more or less portable. Moina Mathers was responsible for painting the elaborate designs of the Vault at Isis-Urania in London and possibly another at Ahathoor in Paris. Moina’s preferred technique was a combination of oil paint and collage on canvas. It is possible that the walls of some Vaults were done in this manner. When my wife and I decided to build a Golden Dawn Temple in the state of Georgia in 1977, it was decided that a sturdier Vault was called for. This involved the construction of a room out of wood and plaster, not only ensuring that the angles of the heptagon would be right, but also that the room would be a virtual soundproof chamber—blocking out all outside noises while at the same time enhancing all spoken vibrations. Israel Regardie consecrated our Neophyte Hall and our Vault on Corpus Christi, June 26, 1982 and initiated two people into the grade of Adeptus Minor. The old house containing the Vault was altered to ensure that its inner chamber could not be discovered by accident. The parlor was completely sealed off from the rest of the house, as if the room never existed. Entrance to the chamber was gained only through a small door cut into the back wall of a closet, which led to the antechamber or portal of the Vault. On the door to this closet was a reproduction of a painting that I had owned for several years. It was a painting by Rembrandt entitled “A Man in Armour.” I hung it on the closet door because I thought it was a nice painting. Later I found out that this painting was said to represent none other than Christian Rosenkruetz. So, unknown to us at the time, we had a painting of Christian Rosencruetz hanging on the secret entrance to our Vault of the Adepti. We all took this as a good sign. “…being equivalent to Post Annos Lux Crucis Patebo—At the end of 120 years, I, the Light of the Cross, will disclose myself. For the letters forming LVX are made from the dismembered and conjoined angles of the Cross; and 120 is the product of the numbers from 1 to 5, multiplied in regular progression, which number five is symbolized in the Cross with four extremities and one center point. On the following morning, Frater N. N. and his companions forced open the door and there appeared to their sight a Tomb of Seven Sides and Seven Corners. Every side was five feet broad, and eight feet high, even as the same is faithfully represented before you. Yeheshua Mihi Omnia— Yeheshua is all things to me. Heh—Eagle—Libertas Evangelii—Liberty of the Gospel. Vau—Man—Dei Intacta Gloria—Unsullied Glory of God. Heh (final)—Ox—Legis Jugum—Yoke of the Law. “It is divided into three parts—the Ceiling which is white; the Heptagonal Walls of seven Rainbow colors, and the Floor whose prevailing hue is black; thus showing the powers of the Heptad between the Light and the Darkness. On the ceiling is a triangle enclosing a Rose of 22 petals, within a Heptangle reflected from the Seven Angles of the Wall. The Triangle represents the Three Supernal Sephiroth; the Heptagram, the Lower Seven; the Rose represents the 22 paths of the Serpent of Wisdom. “And between the Light and the Darkness vibrate the colors of the Rainbow, whose crossed and reflected rays under the Planetary Presidency are shewn forth in these Seven Walls. Remember that thou hast entered by the door of the planet Venus, whose symbol includes the whole Ten Sephiroth of the Tree of Life. Each Wall of the Tomb is said mystically to be in breadth five feet and in height eight feet, thus yielding forty squares, of which ten are marked and salient, representing the Ten Sephiroth in the form of the Tree of Life, acting throughout the Planet. The remaining squares represent the Kerubim and the Eternal Spirit, the Three Alchemic Principles, the Three Elements, the Seven Planets, and the Twelve Signs, all operating in and differentiating the rays of each planet. Note that in all, the Central square alone remains white and unchanged, representing the changeless Essence of the Divine Spirit, thus developing all from the One, through the many under the governance of One. Here is where I disagree with the original text of the Golden Dawn Rituals. I do NOT believe that juxtaposition is correct method for painting the vault squares. It only leads to confusion and makes skrying the squares harder. The Mystical title of the Adeptus Minor is Hodos Chamelionis “the Path of the Chameleon” or “the Path of Mixed Colors.” These colors have to be mixed together, not simply placed next to each other. For example on the Mars Wall (shown), the main color is red. All of the squares are painted according to the colors of the Minutum Mundum diagram. But on the Mars Wall, a little bit of red will be mixed into all of the squares (except the spirit square). All of the symbols on the Mars Wall will be mixed with a little green, which is the flashing color of red. On the Moon Wall the colors mixed in would be blue and orange, on the Jupiter Wall they would be violet and yellow, and so forth. In other words, the seven walls are colored in the natural progression of the rainbow or color wheel, bent so that both ends of the rainbow meet in the east where the infra-red and ultraviolet rays meet—colors which are invisible to the human eye and are symbolic of the spiritual world that exist beyond the human senses. The Fama states that each wall of CRC’s Vault is 8 feet high and 5 feet wide—giving a total of 40 feet which are divided into 10 squares. Westcott asserts that this is a blind—that each wall should have a total of 40 squares, ten of which, “are marked and salient’—they are the Sephiroth.” In the Vault of the Adepti, these are the squares shown with borders around them. In addition to the central square of Pure Spirit, the top row of squares is assigned to the four Kerubim—the Bull, the Man, the Eagle and Lion, which represent the letters of the name YHVH. They are colored as the forces of the four elements and they are always arranged in the Hebrew order of the letters (right to left). 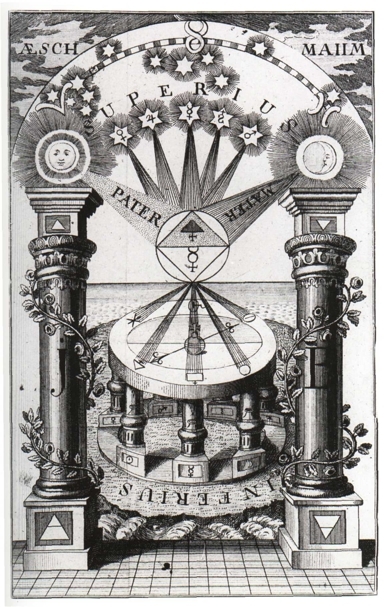 Below the Kerubim are the Three Alchemical Principles: Mercury, Salt, and Suphur on the left, and the elements assigned to the Three Hebrew Mother Letters on the right. The squares of the Seven planets are placed next to their respective Sephirah. The squares of the 12 zodiacal signs are placed in the 5th, 7th, and 8th rows. The Kerubic or fixed signs are shown in the 5th row, in the order of the Tetragrammaton. The Cardinal Signs are in the 7th row in the order of the Equinoxes and Solstices, starting with Spring. The Mutable Sings are in the bottom row. The Tomb of CRC as described in the Fama was most probably never a real building, but rather a symbolic construction—a western Mandala—intended to inspire those like-minded individuals who longed for the dawning of a new, more enlightened spiritual age. Modern day practitioners of various Rosicrucian groups can use the symbolism of the Tomb in meditation and visualization designed to elevate one’s spiritual awareness. An image of the Tomb as described in the Fama can be created in the imagination for Astral Workings similar to pathworkings in the Golden Dawn Tradition. “…breathe in a fourfold rhythm, regularly, and compose your mind. Then being calm and collected, make the full L V X Signs, repeating the accompanying words, and endeavor to bring down the Divine White Brilliance. “Having done this, seat yourself, and give yourself up to meditation, tranquil and without fear. At first try to feel, it may be, or to see the play of the colors as they pass and re-pass from side to side and from square to square. Then await with serene expectation what message may be vouchsafed to you. When you are used to the place it is well to extinguish the light, for the darker the material atmosphere the better it is. Before leaving the Vault make the L. V. X. Signs, and quit it with arms crossed upon breast in the Sign of Osiris risen. […] The next seven visits should be devoted to a careful study of each side of the Vault in turn… Another time, contemplate the roof, and if you feel strong enough, the floor. […] Again you may draw aside the Altar, lift the lid of the Pastos and contemplate the figure you may perceive lying within it. For this you should have a small candle lit on the Altar. Or you may lie down in the Pastos yourself and meditate there. Today’s Golden Dawn Practitioners perform a number of esoteric workings in the Vault, including Rose Cross Rituals, Qabalistic and Planetary invocations, and talisman consecrations. A great deal of astral work—especially Skrying and other forms of clairvoyant methods—takes place there, including Skryings into the various squares on each of the seven walls, into the cross on the floor, the rose on the ceiling, the circular altar, and the diagrams on the Pastos. Every piece of symbolism within the Vault can be a tool for skrying work. But I must say, that simply meditating quietly while sitting in the Vault or lying within the Pastos is the best way to experience its energy and understand its essence as a symbol of the Mystic Center. I would like to draw your attention to a rather humorous looking engraving from the 17th century, published in 1604. The drawing is full of Rosicrucian symbolism—including a rose and a cross on either side of the doorway, a winged bell-tower, a scholar inside the building who is studying a globe, sinners who are being saved from an underground dungeon, new stars appearing in the sky, and the wings of YHVH overshadowing all. It also shows the Temple of the Rosicrucian Brotherhood as a building on wheels—a kind of Rosicrucian mobile home. For several years after the Manifestos were published, many people searched in vain for the original Tomb of Christian Rosencreutz, assuming that a physical Vault existed somewhere in Germany. Even today, some wishful thinkers may hold out hope that the original Vault or some remnant of it may yet be found. Those who do, completely miss the point of the story. Cicero, The Essential Golden Dawn, page 30. Hartman, Cosmology or Universal Science. Art from Cabala, Mirror of Art and Nature, by Steffan Michelspacher. From Heinrich Khunrath’s Amphitheatrum Sapientiae Aeternae (“Ampitheater of Eternal Wisdom”), (1602). From Michael Maier’s Atalanta Fugiens (“Atalanta Fleeing”) 1618. Farid ud-din Attar, (12th century), quoted in Tergit, Flowers Through the Ages, page 46. Here the earliest in the year is Gemini on the left of Mem, and passing left to Virgo, then around to the extreme right to Sagittarius, and then Pisces. From Theophilus Schweighard’s Speculum Sophicum Rhodo-Stauroticum (1618).